This is probably the only time in my life that I'll be early for anything. For the past couple of years, I have been late for everything or forgotten it altogether. Birthdays, holidays, and anniversaries have all fallen prey to my crazy work schedule and my ever fading, gingko biloba resistant memory. Things on the memory front have slowly gotten worse. A few days ago, the hubster dropped me off at work. At the end of the day, I walked down to the parking lot and stood there a good five minutes thinking someone had stolen my car. Last year, I forgot about Mother's Day. Well, not completely (so you can wipe that horrified look off your face). I remembered Mother's Day on Mother's Day (and only because we went out for brunch and it finally dawned on me that the crowds weren't a result of people loving pancakes as much as I did). And that was the year my mother got a giant box of beef jerky. Don't judge, it was the only place willing to deliver on such short notice. So this year, I planned ahead. Well, a week ahead anyway. 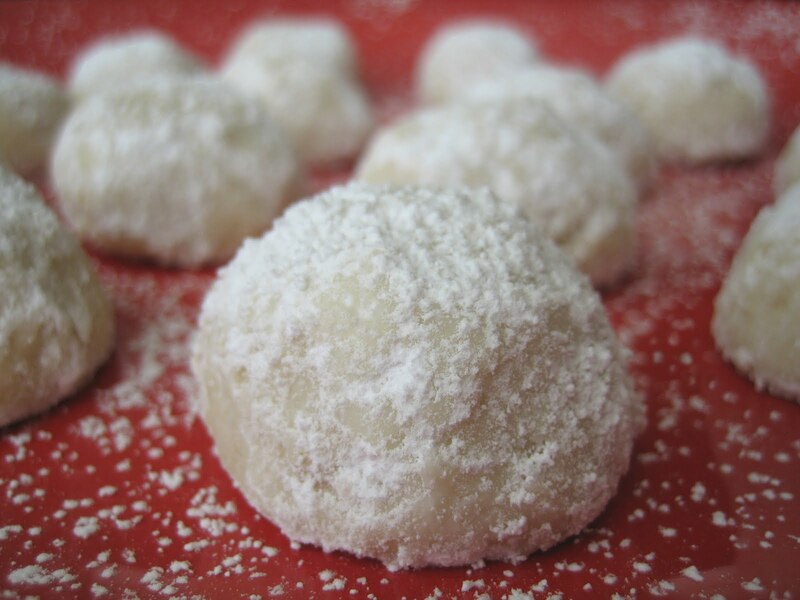 I spent the weekend making Italian Wedding Cookies (or Mexican Wedding Cookies, or Butterballs). Call them what you will, these babies are delicious. Butter, vanilla, almonds. * Mix, roll, plop, bake. Take a giant whiff of the vanilla-scented air in your apartment and know this helps you come back from last year's debacle in a big way. Package and mail to mom before you eat them all yourself. I admit it- I'm pretty proud of myself. My present is in the mail a whole week ahead of time. Except I know I shouldn't get too excited. I've already forgotten about Father's Day. *I like to toast my almonds for that extra crunch in an otherwise super moist cookie. I've read that you can substitute pecans for the almonds but I don't like to mess with a good thing. 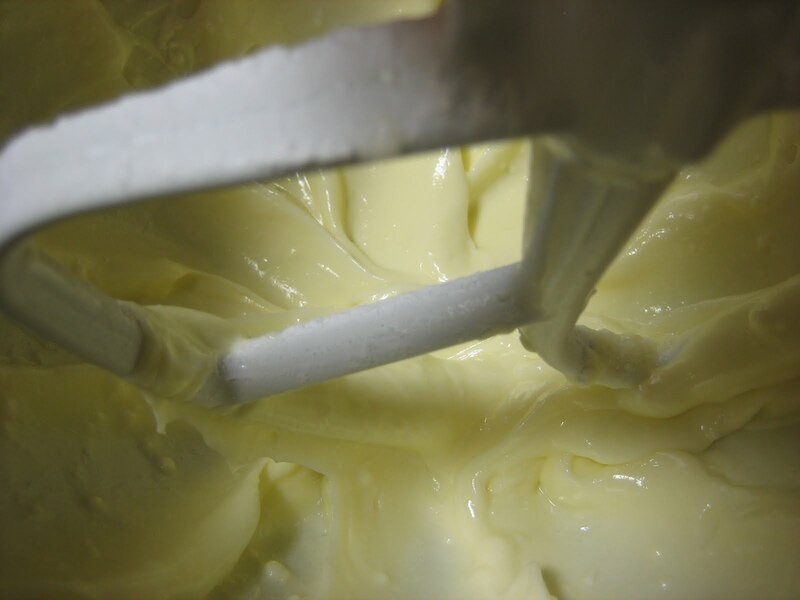 Cream butter or margarine in a bowl, gradually add confectioners' sugar and salt. Beat until light and fluffy. Add almonds and vanilla. Blend in flour gradually and mix well. 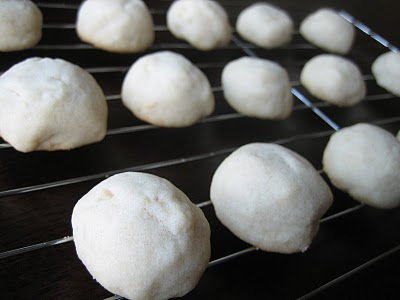 Shape into balls (or crescents) using about 1 teaspoon for each cookie. Place on ungreased cookie sheets, and bake for 15-20 min. Do not brown. Cool slightly, then roll in the extra confectioners' sugar. your cookies look wonderful!!! I'm, sure they will make a great mothers day treat! So Pretty! They look even better than the original recipe. Extra special touch because they're going to Mom huh? Good job. I want to follow your blog but don't see a follow button. I'm still not too great at computers. Keep in touch! I love these little cookies, they've always been one of my favorites. Chef Dennis- Thanks! I have bookmarked your Moroccan Vegetable Wraps to try soon! Lisa- Maybe try clicking on the light blue Follow at the top corner of this page? I'm also not great with computers. Thankfully, the hubster is a techie! yum! these look great, and i really just want to stick a spoon in that bowl of batter! and YAY for lawyers who cook! Emily- They're so simple (and delicious! ), it's crazy! You'll have to let me know how you like 'em. I saw your beautiful photo on photograzing.com and had to click through. Looks like a great recipe and a lovely gift for your mom!